In malls, theaters and other spaces, Reactrix creates highly entertaining branding displays that respond to the physical movements of the audience. The resulting “brand play” makes Reactrix the highest engagement advertising available today and reaches top-market venues with monthly traffic exceeding 100 million. Advertising’s ability to capture attention and spur real brand involvement has been almost non-existent. Each quarter, the measured performance of traditional media continues to erode. 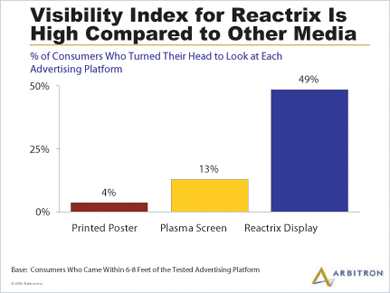 In response to the lack of audience brand involvement in traditional media, lies the creation of Reactrix - the first out-of-home advertising vehicle that allows for true brand interaction with its audience. Reactrix creates highly entertaining branding experiences that are projected in public spaces. These advertisements respond to the physical movements of the audience and engage them in true brand interaction. The result for the brands that are the subject of “brand play” is unprecedented brand name recall, enormous purchase intent, and message delivery recall that is astonishing. In fact, this new media form actually keeps people’s attention longer and creates more memorable brand messaging than any other out-of-home venue, as well as most television commercials. Natural human interfaces, ones that involve human movement, for example, tend to be incredibly engaging. 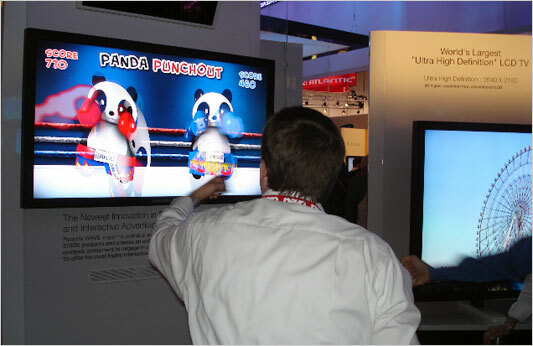 It's rarely more noticeable than at CES 2008--the crowds nearly always gather around those exhibits that provide some kind of interactivity. 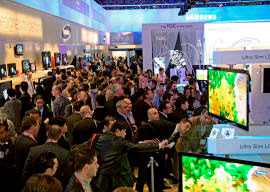 One of the most popular has been the WAVEscape advertising platform, developed by Reactrix and exhibited in partnership with Samsung. WAVEscape is a stereo near-infrared vision system that sits above a television to enable interactions between viewer movement and content on the screen. It uses a stereo 3D vision system to sense the distance of a person from the television. In the same way a person has two eyes to gauge proximity, the computer can get the full shape of everyone's body up to 15 feet away. 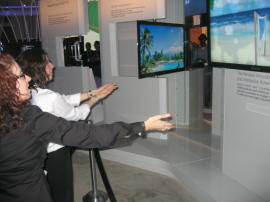 At CES, Reactrix demonstrated how users could stand in front of a Samsung LCD and interact with several games and information sites using the movement of their limbs. 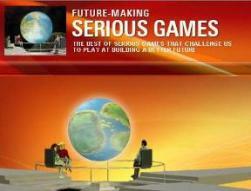 The technology is being used as a means of engaging people in a public space for interactive display advertising. Reactrix's first big customer is Hilton Hotels, which will provide the technology in its lobbies and other public spaces to both entertain and provide information on hotel services. WAVEscape was developed by Matt Bell, Reactrix's chief scientist and founder. 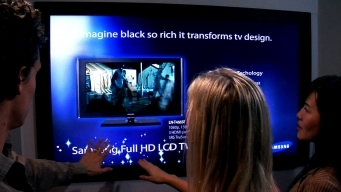 "We are using these technologies to reinvent out-of-home advertising," Bell said. "Most advertising outside of the home is billboards and digital signage. I describe this as glance media--you look at it for two seconds, if that, and then you move on. What we do is engage people, get them interacting. 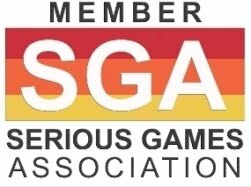 They have fun and therefore the advertiser loves it because the user remembers the message, and the venue is happy because the venue is more interesting." 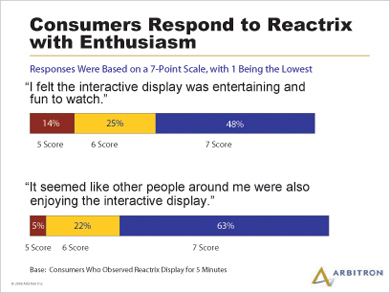 Bell says users are 10 times as likely to recall the message of an interactive advertisement as a static one. "It is a revolution in the way people relate to TVs," he said. "The TV is now able to sense you and respond to your wishes."